The Moving Forward Task Force, chaired by Robbie Ausley, has gathered twice. In our meetings, we acknowledged the work being done around the United Methodist Connection to actively resist the actions of the General Conference and to explore potential ways to proceed for the long term. 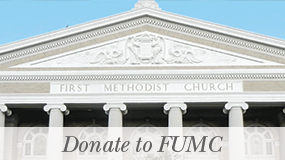 We clarified that our current work is not to address FUMC’s long-term relationship with the UMC. The future of the denomination is fluid at this point; various groups are meeting and discerning the best way forward for progressive and centrist churches who do not feel they can live with the Traditionalist decision of the General Conference. I am part of several of those conversations. In late March, I met with a small group of leaders from throughout the UMC, including bishops, agency leaders, large church pastors, and leaders of caucus groups, and we discussed a range of possibilities. The second part of that meeting was held this week in Atlanta, where another small group continued the work we began. That movement, called UMC Next is taking shape; we anticipate that the coalition will expand to a gathering in May, consisting of several hundred people representing every Annual Conference. To find out more, see their press release. 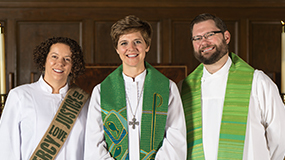 Acknowledging the slow, steady pace of that work, our FUMC leaders feel the need for a more immediate response as we wait and watch those plans unfold. There was a strong consensus in the room: we can’t sit by and wait while doing nothing. The Moving Forward Task Force is currently researching potential responses that accomplish these outcomes. The members of the task force are listed below. We invite you to pray for us and for our work, and the members are open to hearing your feedback. We’ve developed a brief survey that we invite all members to complete. Click here to take the survey. Our task is to present recommendations for response to the Administrative Board on May 19. I remind you that these will be recommendations and will be unlikely to effect change on that day. Any major changes will be brought to the congregation for a churchwide vote some time following the May 19th meeting. Finally, a longing was voiced in the room by a couple of LGBTQ members of the task force: “I wish we could get out of the spotlight and just be a regular part of the church.” That longing weighs heavily on my heart. I, too, long for a church and a world in which there is no need to fight for the rights of LGBTQ people, where all can simply be a welcome, vital part of the body of Christ, contributing and receiving together. The truth is, the Gospel is the same for every one of us: God is making all things—even us!—new. Ideally, all people would be equally welcome and able to engage in the mission of our church, with access to all ministries (including weddings) and the ability to lead at all levels (including clergy). That simply is not the world or the church in which we live right now; therefore, we are called to dedicate ourselves to work for change. We walk a fine line; on one hand, our ministry goes far beyond advocacy for the LGBTQ community, and on the other hand, we are in a particular time and place, facing a particular crisis, and we must address that head-on. I know many of you experience these conflicted feelings. I am with you. We will continue to find our way together, trusting in God to guide us, feed us, and accompany us on this journey. I’ll say it again: it is an honor to be your Pastor. Thank you for that privilege and for your commitment to build a community where all people are invited to know the love of God and sent to join God in transforming the world.